When I was younger, we used to have caramel popcorn as a treat and for that reason, it has always held a special place in my heart. So when I came across a recipe for salted caramel popcorn with peanuts (so double the amount of salt!) I couldn’t resist. For those of you who haven’t tried it you can’t really taste the salt in it, it really tastes like caramel popcorn with peanuts on top (or peanut butter popcorn) – really nice and different from the norm. I have had this recipe under my belt for a while now and I am so excited to share it with you all. It’s a unique recipe – I found that when I was playing around with it that you can create three distinct flavours depending on if and when you add the peanuts – the choice is yours! Step 1: Pour the popcorn into a large bowl – make sure there is space between the top of the popcorn and the top of the bowl. Step 2: Preheat the oven to 120°C / 250°F and line two baking trays with baking paper. Lightly spray both of the baking paper’s with olive oil. Step 3: In a medium saucepan combine sugar, maple syrup and butter over medium heat. Continue stirring until completely melted and bring to a boil. Boil for five minutes, stirring once. Step 4: Remove from heat and add salt (1/2 tsp), baking soda (1/2 tsp) and vanilla (1 tsp). This will result in the mixture suddenly ‘foaming’ up. Immediately pour over the popcorn in the bowl, and mix it to combine with a spatula and/or wooden spoon. 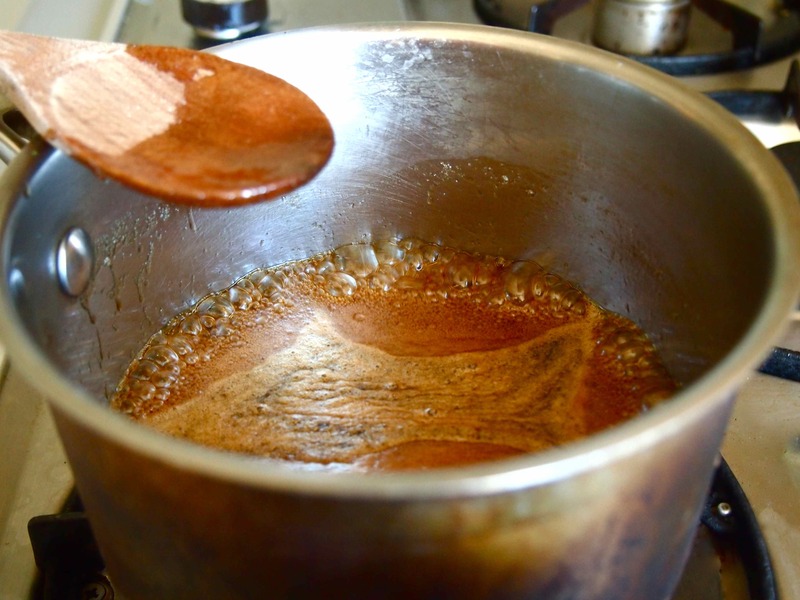 You need to be quick here as the caramel will start to harden and the mixture will be quite sticky. Make sure that you get to all the popcorn at the bottom of the bowl. Step 5: Once the caramel mix and popcorn is well combined, pour half the popcorn onto each baking tray and spread it out so it is a single layer. Sprinkle with 1 1/2 tablespoons of salt and add your crushed peanuts (unless you added your peanuts during Step 5 – (see above) or have decided to not use peanuts at all). Step 6: Place both trays into the oven and bake for 30 minutes. Remove from the oven and allow to cool as they will be incredibly hot. Step 1: Pour popcorn into a bowl. Step 3: Combine ingredients in pot on stovetop. Step 5: Pour crushed peanuts and salt onto popcorn. 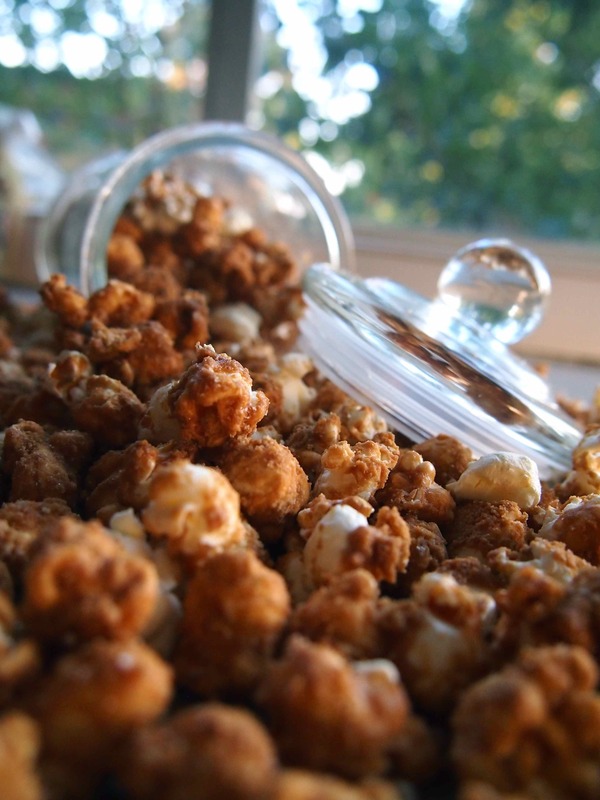 * You can make the popcorn yourself by using a 1/4 cup of popcorn kernels and 1/4 cup of oil. All you’ll need to do is put a large pot over medium heat, add the oil and place two (yes, just two) popcorn kernels into the pot until they pop – once they have popped you can place the rest of the kernels into the pot in an even, single layer. Then place a lid over the top of the pot and just wait until you hear all the kernels pop. You’ll hear a lot of kernels pop at once, but once the popping slows down, carefully remove the pot from the heat (keeping the lid on!!! This will give the remaining kernels an extra chance to pop). Remove the lid and pour the popcorn into a large bowl and go to Step 2 above. You’ve now completed Step 1 above :). I hope you enjoy making and eating this recipe as much as I did – which was a lot! Especially at Step 5 when it suddenly starts foaming when you add the extra ingredients. Maybe childlike of me but it is surprisingly fun watching the chemical reaction. P.S I have altered this recipe, but the original recipe comes from blogger My Darling Vegan. So good! Will make you re-think your popcorn situation a bit :). My oh my oh! Next up at MY house!! It’s so good. I’ve made it many many many times already! May I kindly say, that although I’m not a foodie…sorry, your talent as a food photography is outstanding and I love your compositions…a feast for the eyes…! Thank you so much angelaseager! That is such a lovely thing to say :). They will love you all the more for it :). Just remember to let it cool before eating it as it is very hot when it comes out of the oven! It really is :). You can’t just stop at ‘one’ piece! 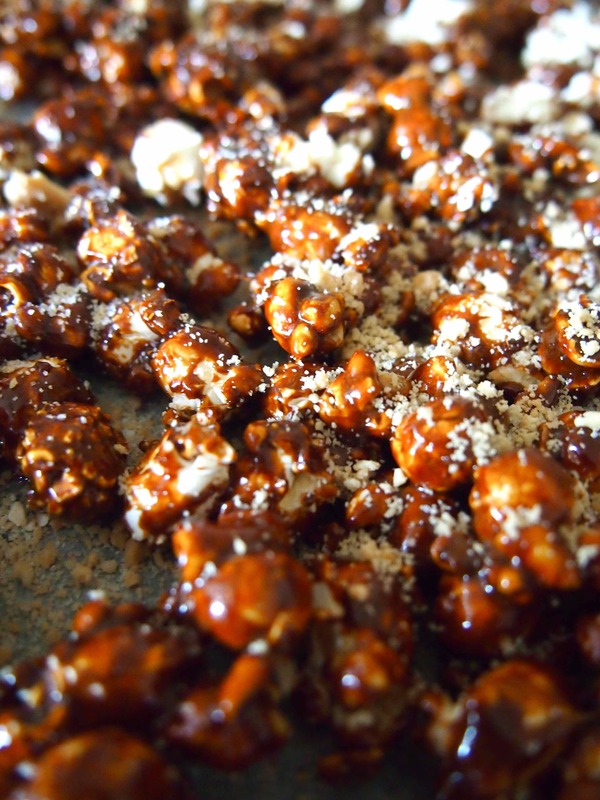 Well I absolutely love going through all your amazing recipes 🙂 Enough to make a mouth water.. these caramel popcorn seem the yummiest though! I was wondering if you could post a recipe for people who have absolutely no idea about cooking? Keep uo the great work! I love the Serbian version of popcorn (they eat a lot of it, it’s like ice cream or sweets in the street): with a lot of butter and a dash of salt. The Serbian version sounds amazing. If I visit there I will definitely have to try it! I now have to dash off to the shop my lunch break and get popcorn immediately! Lovely photos and tasty food! What a good use of your lunch break! They are insanely addictive but at least they are quick to make :).